Baby it’s cold outside – OK understatement, it’s arctic! 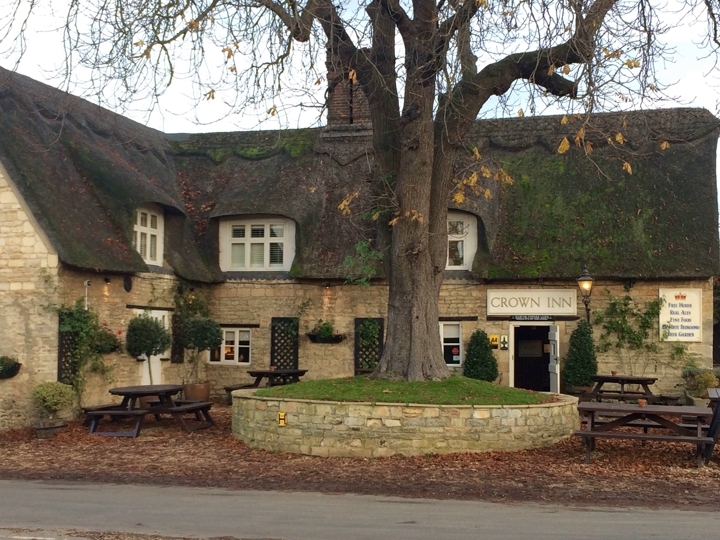 Nothing for it but to hunt out the thermals, grab some woolly socks and make a beeline to one of the toasty, pubs to keep you warm through January. This list has been selected with as much geography as I can muster to ensure that those Muddy readers hibernating in Huntingdon and Peterborough are catered for as well as those holed up in Ely and Cambridge. If you’re trying to force your body out of its vegetative state this month, some of the pubs offer a brisk walk option to increase the oxygen levels. However if that sounds like waaaay too much effort, put your energies into bagging the chair by the fire and get the first order in! Effortlessly elegant and stylish sums up the Punchbowl, set in the picturesque village of Horningsea with is quaint village green a few miles north Cambridge City centre. Bundle into the Grade II listed pub and snuggle in front of the inviting roaring fire until April comes and you can venture into the outside world again. The relatively recent interior redecoration has retained a stylish olde-worlde charm with warm painted walls and original timber beams. Beautiful wall accents incorporating Horningsea’s pottery craft traditions (dating as far back as the Romans) have been incorporated into the stylish décor. Wine focuses on the Languedoc-Roussillon region for French wine lovers, but if you fancy something a little different a homemade punch (sounds lethal) and locally produced Cromwell cider are also served. For rumbling tummies I can highly recommend the hearty meat board – ham freshly carved from the counter and homemade pickles all served by the fire. OMG, I think I have found my ‘forever’ house. The only problem is that it’s a pub! Anywhere in Grantchester gets my vote: full of chocolate-box cottages, it has 3 pubs for goodness sake, how greedy is that?! 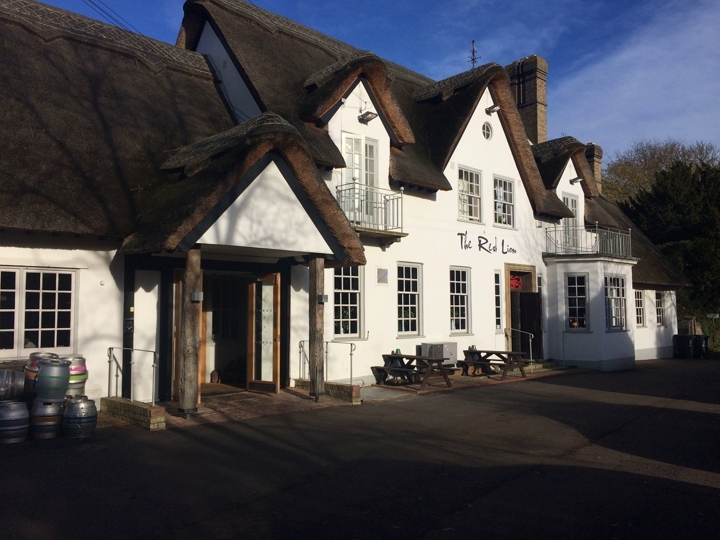 The Red Lion is a let’s-settle-in-for-a-boozy-afternoon type of place with vintage leather upholstery, a splash of tartan, warm wood floors and beams and – heavenly wowzers – three woodburners, so every nook and cranny of this homely interior is toasty. This pub just understands people: low on rules, high on charm, and above all friendly – dogs, children and anyone you happen to have in tow are all welcome. They even have doggy treats on the side for four-pawed guests. Sunday lunch does get busy so if you think the troops might play the starvation card, ring ahead and book. 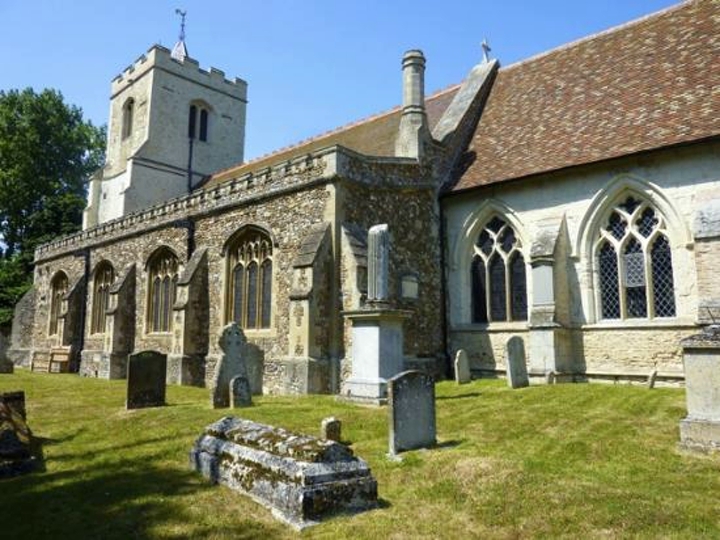 If you fancy a little snoop, mosey a little further down the High Street and poke your nose into the beautiful village church that dates back to the 14th Century. 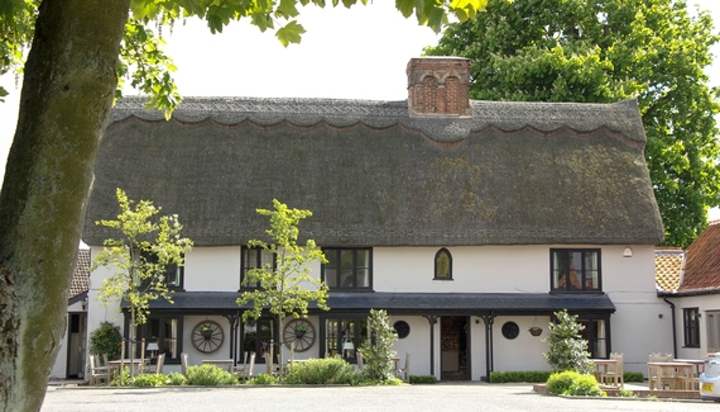 It was featured in the filming of the holy sleuth television drama Grantchester. Read my full review here. 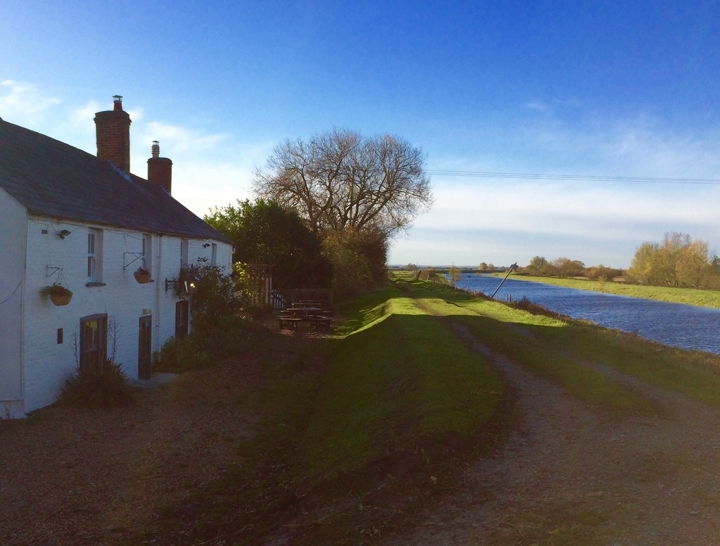 Anchored in the peaceful fenlands a few miles from Ely, this pub literally sits on the towpath of the New Bedford River. If you can arrange to visit on a beautiful day it’s perfect for a brisk walk to blow away the cobwebs. Alternatively if the weather is bleak, hunker down in the pub – this place knows how to ooze cosy out of every nook and cranny. Traditional dark wood paneling, low beamed ceilings, terracotta floors (no worry about muddy boots then) and a woodburner blasting out all day during the winter months make this a perfect weekend haunt. Trust me, you won’t want to leave, it’s a total gem in the fens but you’ll need to trust the sat nav to find it. 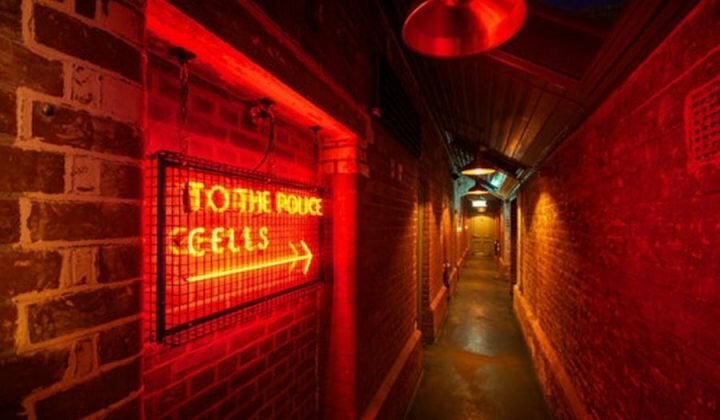 Want to combine the pub with a walk? Step out of the front door, turn right and follow the towpath towards Mepal for a mile or so. The path is flat so is perfect for walkers, runners and cycles. Enjoy those famous wide skies and beautiful sunsets, don’t forget the binoculars if you fancy a bit of a twitch and you never know you might even spot a seal, the river is tidal from the Wash.
Set in the beautiful village of Elton, about 5 miles west of Peterborough, The Crown Inn is everything that a pub should be – thatched, warm and inviting. It boasts two massive roaring inglenook fires, exposed stone and an enticing mixture of traditional interiors with a modern twist. 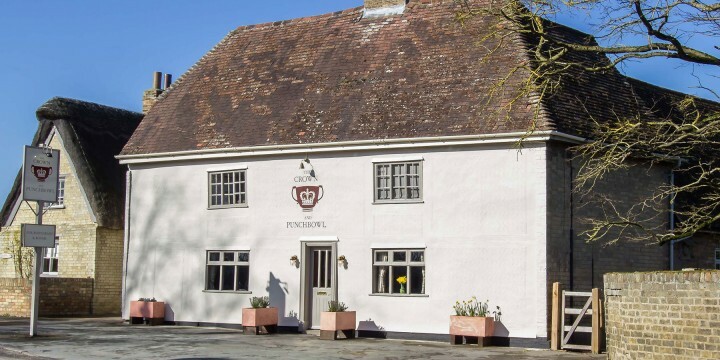 The Crown Inn is a family run affair and they totally ‘get’ children and dogs too. The food is sufficiently gastro to entice adults but, importantly if you’re coming with kids in tow, there’s a nutritious, simple children’s menu plus they offer smaller portions of the Sunday roast for those that fancy joining in with the adults. Colouring and games are available to keep the children amused during those winter lunches, as are high chairs and baby facilities. The pub is currently brewing its own beer – obviously not for the kids but it will keep Mr. Muddy happy and makes a great pub for a family gathering. Upstairs they have eight beautifully styled rooms, so if you can’t make it home I’d settle for a sleep over. 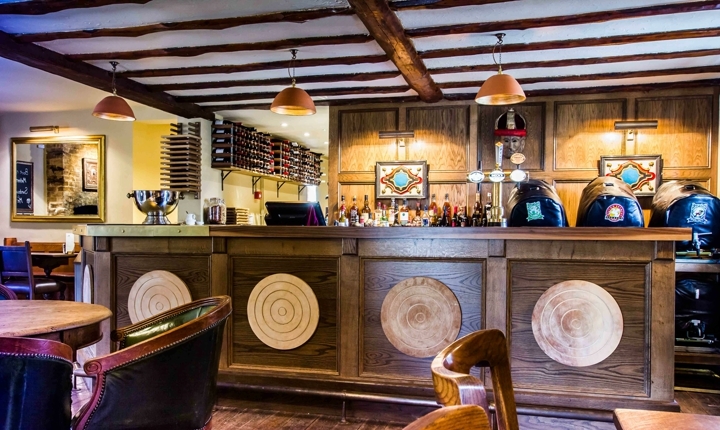 A quintessential 16th century country pub set in the tranquil and historic village of Balsham on the Cambridge/Suffolk border. 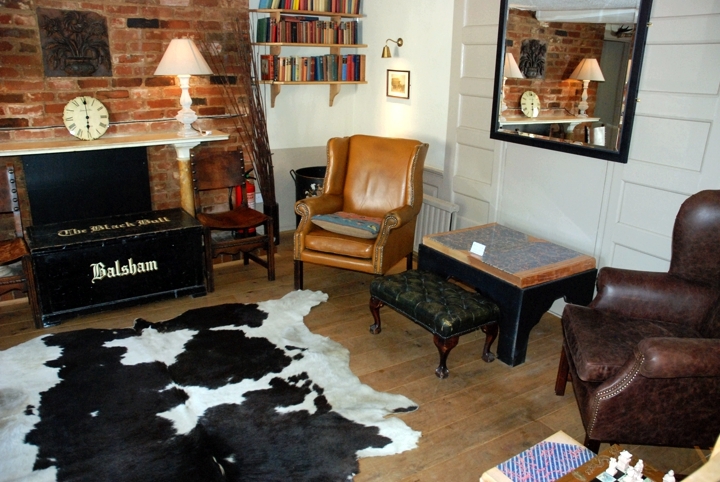 All very wattle and daub – expect a traditional interior of flagstones and beamed ceilings in keeping with its Tudor roots, leather sofas and chairs fronting the roaring fire, cowhide and kiilim rugs and an eclectic mix of occasional tables. The Black Bull Inn is perfectly entitled to boast about its 40 wines on offer, 12 by the glass for those not into a heavy session. On the pumps are Red & Black, their own label, and three other rotating guests. 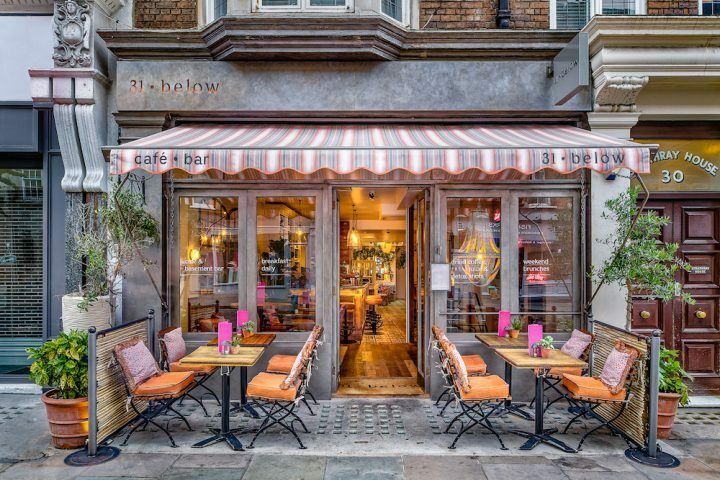 A perfect setting for an evening drink with friends, fab food also makes this a warm winter winner. Eltisley is a picturesque English village where the pub spills out onto the pretty village green and the soothing sound of leather on willow can be heard during the summer months. 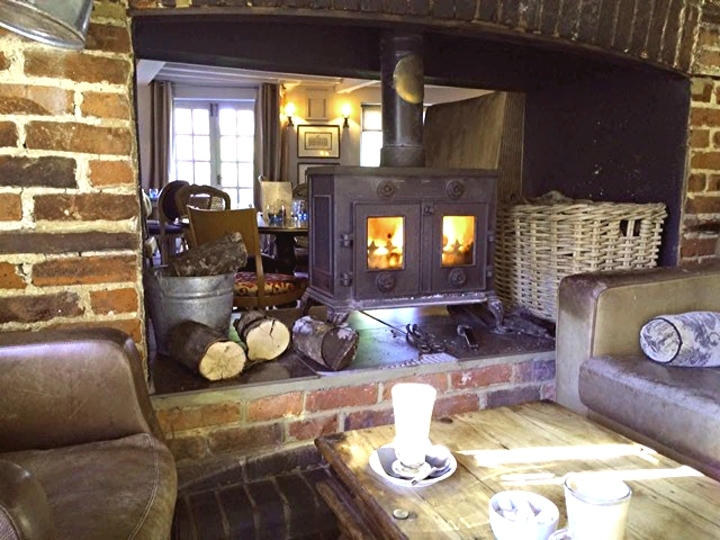 The Eltisley has the compulsory leather sofas and wood burner for any pub to be considered ‘winterable’ in my opinion. A huge enclosed garden is perfect for muddy dogs; they also get the best seat in the house by the fire, which gains a ‘woof’ from the Muddy pooch. 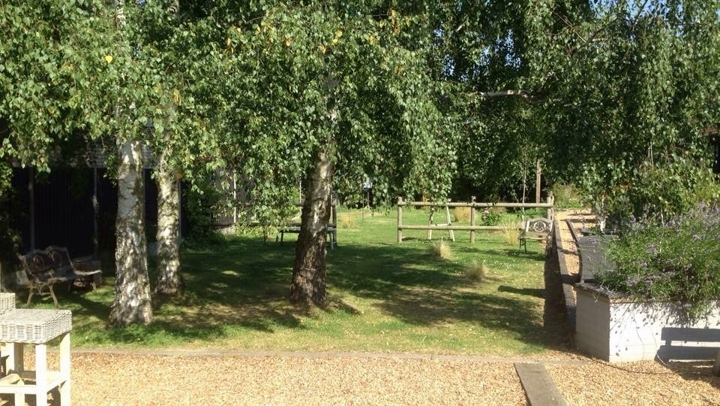 Eltisley sits bang slap in the middle of Cambridgeshire, an ideal spot to meet friends for a romp through the countryside. For serious hikers, who like to cover some ground, head south from The Eltisley over the village green and pick up the footpath towards Waresley & Gransden Woods, dogs are allowed in the woods as long as they are on a lead. Just toooo tired for that – opt for the shorter option and explore the footpaths in and around Croxton and Caxton. Stagger to the pub for a well-earned post workout (*cough, cough *) glass of whatever-takes-your-fancy! 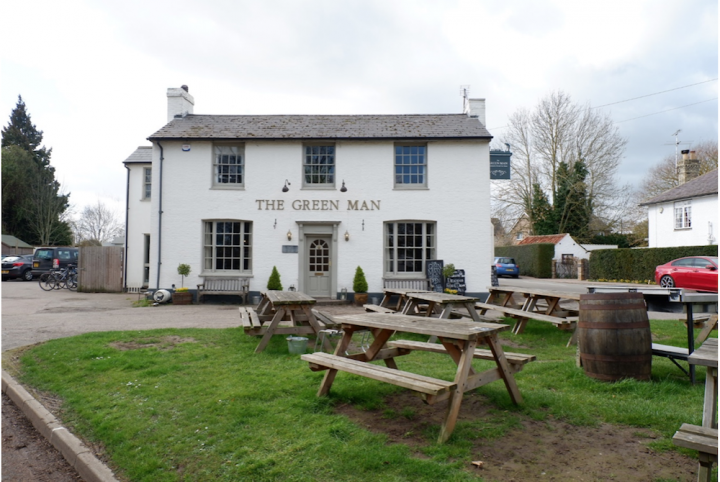 The pub offers a good selection of wine, locally brewed beer and a great menu to boot.